Ongoing observations with the Atacama Large Millimeter/submillimeter Array (ALMA), however, have discovered surprising examples of massive, star-filled galaxies seen when the cosmos was less than a billion years old. This suggests that smaller galactic building blocks were able to assemble into large galaxies quite quickly. “With these exquisite ALMA observations, astronomers are seeing the most massive galaxy known in the first billion years of the universe in the process of assembling itself,” said Dan Marrone, associate professor of astronomy at the University of Arizona in Tucson and lead author on the paper. The galaxies that Marrone and his team studied, collectively known as SPT0311-58, were originally identified as a single source by the South Pole Telescope. These first observations indicated that this object was very distant and glowing brightly in infrared light, meaning that it was extremely dusty and likely going through a burst of star formation. Subsequent observations with ALMA revealed the distance and dual nature of the object, clearly resolving the pair of interacting galaxies. To make this observation, ALMA had some help from a gravitational lens, which provided an observing boost to the telescope. Gravitational lenses form when an intervening massive object, like a galaxy or galaxy cluster, bends the light from more distant galaxies. They do, however, distort the appearance of the object being studied, requiring sophisticated computer models to reconstruct the image as it would appear in its unaltered state. This “de-lensing” process provided intriguing details about the galaxies, showing that the larger of the two is forming stars at a rate of 2,900 solar masses per year. It also contains about 270 billion times the mass of our sun in gas and nearly 3 billion times the mass of our sun in dust. “That’s a whopping large quantity of dust, considering the young age of the system,” noted Justin Spilker, a recent graduate of the University of Arizona and now a postdoctoral fellow at the University of Texas at Austin. 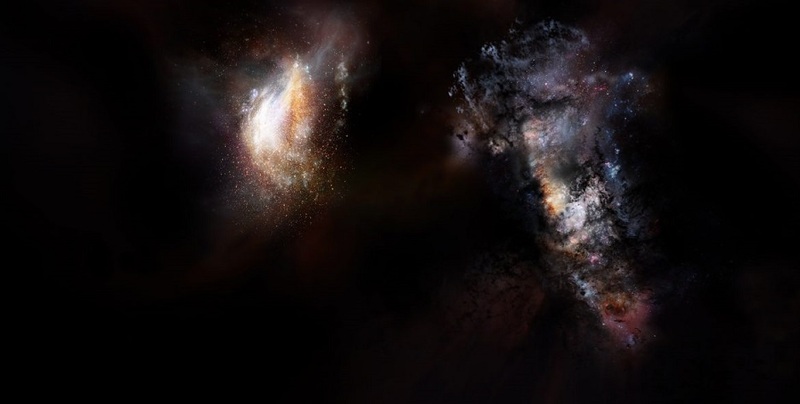 “In any case, our next round of ALMA observations should help us understand how quickly these galaxies came together and improve our understanding of massive galaxy formation during reionization,” added Marrone. We can get information about galaxies from scientists. It is explained that best essay company 2018 services also gathering information about galaxies. There are some larger galaxies. Scientists are working to observe galaxies and to get accurate information. So, we come to know about massive galaxies.